SINGAPORE - More workers in the private sector last year took home bigger pay cheques from 2016, said the Ministry of Manpower (MOM). In survey results released by MOM on Wednesday, a higher proportion - 78 per cent - of some 600,000 local employees (with at least a year in service) polled reported a salary increase. This is up from 75 per cent in 2016, as the economy picked up. 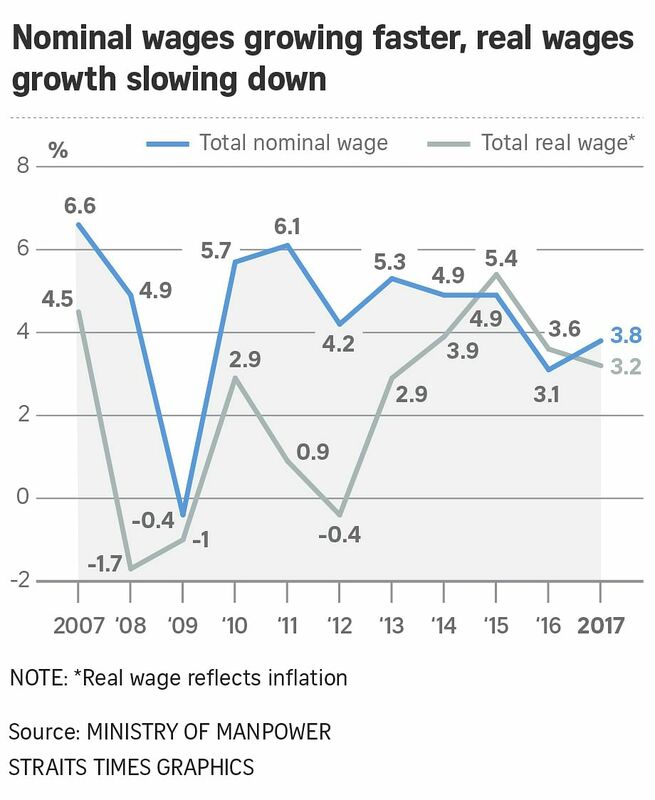 However, their real wage growth slowed compared to in 2016, due to rising costs of living, said the ministry. Inflation increased to 0.6 per cent last year, up from -0.5 per cent in 2016. Nominal wage growth last year stood at 3.8 per cent, compared to 3.1 per cent before. 10 per cent of employees saw wage cuts, down from 13 per cent. 75 per cent of companies were profitable, down from 76 per cent. The MOM survey also dwelled at length on the plight of low-wage workers who earn a basic wage of up to $1,200 a month. Most gave a wage increase equal to or more than the recommended amount of $45 to $60, in accordance to guidelines issued by the National Wages Council. Among those that did not grant wage increases to such workers, the top reasons cited were poor business (16 per cent) and already paying market rate (15 per cent). Many were in industries such as transportation and storage as well as construction.